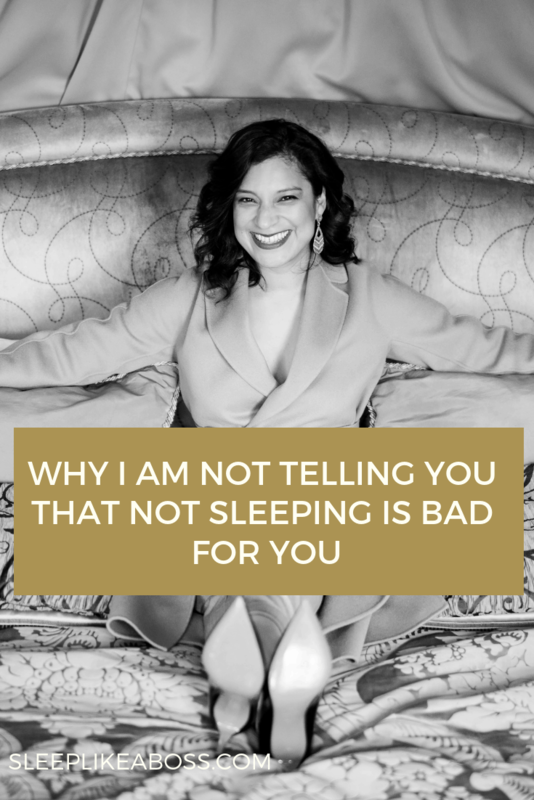 Today I will tell you why I don't take part in the strategy that most sleep experts take, which is scaring people into doing something about their sleep! There are two different kinds of school of thought about this. Pretty much every sleep book out there that I've researched or that I've read, takes the approach to will tell you all the horrible things that sleep deprivation will do to you. The chapters will usually be about how sleep is tied to XYZ, your brain, your hormones, your skin, your psychological capacities, how you process stress, and so forth. It basically tells you about all these people who didn't sleep enough and all the research they've done on people, who didn't sleep enough and how it made them sick and how it had all these horrible consequences. Now, if you are into marketing, one of the strategies is very often to make people aware of what is happening if they don't get a solution to your problem and to tell them how much they are losing if they are not taking action about it right away. In my case for example, I could mention to you in every blog post how horrible it is that you're not sleeping and then tell you what you'd be losing if you didn't hire me straight away. 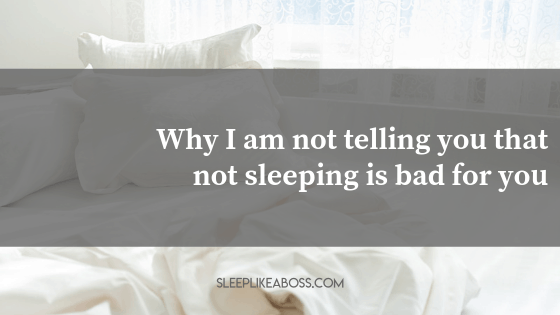 Here's why I don't do that: When I work with my clients, they know (believe me) that not sleeping is not great for them because they can feel it. They can feel that they are forgetting things. They can see how people are looking at them when they snap. I don't need to preach it all the time. Believe it or not, it actually creates the opposite effect. They are already stressed and me reminding them of it, would just put them under more pressure and frankly, I don't want to work with people who don't know what not sleeping is doing to them and who need to be scared into working with me. I don’t believe in that approach. I want to work with people who know that they have an issue and who want to change it, because they know that they can perform so much better, can be better leaders, better family members, better partners, lovers, teachers, mentors, and parents. It needs to come from within. Many of my clients are so stressed when they don't sleep that the anxiety of knowing what it is doing to them (they literally imagine what effect it is having on them, while they are lying there not being able to sleep) is creating so much more anxiety, which in turn, is keeping them from sleeping even further. So, here's my very honest and endearing advice to you guys, if you are awake, and can't fall back asleep and you don't want to fall into that anxiety and into that spiral of “no!.. and now I'm not sleeping, so hence, this and this and this is happening to me…”: You've survived nights like these before and yes, the next day is not going to be ideal, but you are going to pull through. Your body is incredibly resilient. You can do tons of exciting things. If you have a bad night, make sure you look at your schedule for the next day and when you can get a 10-minute break, take it. Take that break, put on some noise-canceling headphones and get out of the office. Think of it like a cigarette break. People who are chronic smokers, they will go outside and have their cigarette break without any bad conscience or justifying it to anyone. You can do the same, except you won't be smoking cigarettes, but you'll literally just take some time to rest. It is going to help you recuperate. I would even go as far as advise you not to read any of those studies or books that are going to freak you out even more. First of all, there is a lot of help out there and secondly, it's not going to happen right away. You can get informed. You can look at my blog. There is a lot of free advice on there. There are amazing videos and many resources out there. If you or someone you know is lying awake at night and having that anxiety and this vicious cycle of “I'm not sleeping, hence this is happening and I'm getting even more tense and I can't fall asleep at all or even less now”, know that you will manage to overcome it! You've managed so many times, you will manage again until you find your solution, which you will! I'm absolutely certain of it! With that, I wish you a wonderful Monday and a beautiful rest of the week.